Heat Therapy Wrap Supercharge allows deep conditioners to penetrate hair better. Turban style heat therapy wrap restores and rejuvenates your hair with warm soothing heat. The patented system using gel packs that are inserted into the cap gives a uniform and lasting heat, up to 20 minutes. The cap is simple to use just insert the packs into the cap put the entire cap in to the microwave than put it on. The cap itself is washable. The cap is cordless so you are free to move around while the cap is hard at work. 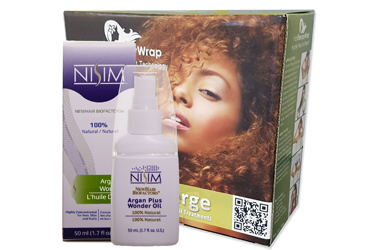 Nisim's Argan Plus Wonder Oil improves skin elasticity, decreases the appearance of wrinkles, reduces the appearance of scars and stretch marks, improves epidermis texture, moisturizes and protects dry skin , nails and cuticles, increases hair shine, strength and body, and dramatically improves the overall softness of all body areas. Coco-Caprylate, Caprylic/Capric Triglyceride, Olea Europaea (Olive) Fruit Oil, Cocos Nucifera (coconut) Oil, Argania Spinosa Kernel Oil, Calophyllum Tacamahaca Seed Oil, Plukenetia Volubilis Seed Oil, Tocopherol.